The British right-wing press routinely depicts Jeremy Corbyn as someone who will establish a Marxist administration over the United Kingdom should he become Prime Minister (Cammaerts et al 2016: 9). An outlier in the Labour Party for many years following his election to parliament in 1983, few predicted his rise to the office of party leader in 2015. His 2017 election manifesto featured many elements that typified his political and social stances, such as the establishment of a £10 minimum hourly wage by 2020, reintroducing the 50p rate of tax on the highest earners and nationalising England’s water and rail companies (Labour Party 2017: 47, 19). Moreover, one key policy that caught the attention of commentators and voters was the pledge to eliminate university tuition fees (Ibid: 43). This idea was presented as a way to end educational inequality, and to encourage an increase in the number of students from disadvantaged backgrounds being able to access the highest levels of education. However, this policy would not necessarily be successful in its stated goal. Between 2012 (when £9000 fees were introduced) and 2017, university application rates for the most disadvantaged areas rose by 4.4%. Over the same time period, for the most advantaged areas, the application rates increased by 3.2% (UCAS 2018: 27). Under the new system, institutions charging fees of £6000 or more must have an access agreement approved by the Office for Fair Access (OFFA), which ensured that access spending from higher education establishments rose from £400m in 2011/12 to £833m in 2017/18 (OFFA 2016: 5), mainly in the form of fee waivers, outreach programmes and measures to increase retention, all aimed at students from underprivileged backgrounds. Nonetheless, the overall situation remains very skewed. 52.1% of 18 year-olds from the most advantaged areas apply to university, versus 22.1% from the least advantaged areas (UCAS 2018: 27). Consequently, abolishing tuition fees benefits the rich and the middle classes, as more students from these backgrounds attend university than those from more disadvantaged backgrounds, thus creating a large state resource that privileged families will use more. Labour’s efforts aimed at those from poorer backgrounds will ultimately help those who can more easily afford a university education. Furthermore, university is not the stage where inequality between students arises. Differences between grades and application patterns are already entrenched by the age of 18, so free higher education is a very inefficient means of achieving equality of opportunity. Rather, investment should be targeted at dynamic, engaging early years education in order to close the gap which stems from birth privilege. In their defence, the 2017 Labour manifesto did pledge to ‘make significant capital investment during our first two years in government’ into pre-school education, thus ‘increasing staff wages and enhancing training opportunities’ (Labour Party 2017: 35), but the planned budget allocated only £5.3bn to pre-schooling, compared with £11.2bn for universities (The Guardian 2017). Corbyn promised 30 weekly hours of free childcare during term-time for all two-year-olds, marking a significant increase from the 15 hours currently on offer to the poorest 40% of society, but Neil Leitch, chief executive of the Pre-school Learning Alliance, said that ‘if Labour’s policy costings are based on existing early years funding rates, which have long been insufficient, then this pledge will inevitably will be underfunded’ (Gaunt 2017). Focus on tuition fees has had an effect elsewhere too. Due to the financial allocation to universities, Labour’s planned spending on social security amounted to £4bn, to cover an increase in Employment and Support Allowance by £30 a week for those of working age, scrapping the bedroom tax and restoring housing benefits for under 21s, among other policies. This sum of £4bn included £2bn to reverse cuts to Universal Credit, though the Institute of Fiscal Studies estimated that £3bn would be necessary for an effective reestablishment of the scheme. Furthermore, the IFS study indicated that Labour had committed to neither stopping the benefit freeze nor to reversing the cuts to child tax credit, both of which had been effected by the previous Conservative government (Hood et al 2017). In the run-up to the election, party officials were contradictory on Labour’s stance on benefits, with Emily Thornberry saying that, “I don’t think we can reverse [the benefits freeze] entirely. We shouldn’t be promising things we can’t afford”. Jeremy Corbyn then declared that, “clearly we are not going to freeze benefits, that is very clear”, though in the same interview admitted that the party had not made a manifesto commitment on the issue (Merrick 2017, Savage 2017). It was claimed that an increase in the minimum hourly wage to £10 by 2020 would offset the ongoing benefits freeze (Merrick 2017). The similarities between this argument and that offered by George Osborne when delivering his 2015 budget, which proposed the benefits cuts, are remarkable (Watt and Stewart 2015). Corbyn knows that he is seen as a man of the people, someone who is on the side of the underprivileged against crony politicians who work only for personal gain. Despite UKIP acting comparably to a gateway drug, swaying former staunch Labour supporters in the direction of the Conservative party, the MP for Islington North knows that the core traditional Labour vote is safe under his leadership. Consequently, he knew that to win a majority, the party had to win seats outside its traditional heartlands, and that the young vote represented a significant untapped resource which would enable this to be achieved nationally. The Labour leader should be praised for encouraging a high young turnout, with the voting rate among 18-24 year-olds at its highest since 1992, 62% of whom voted for the Labour Party (Skinner and Mortimore 2017). 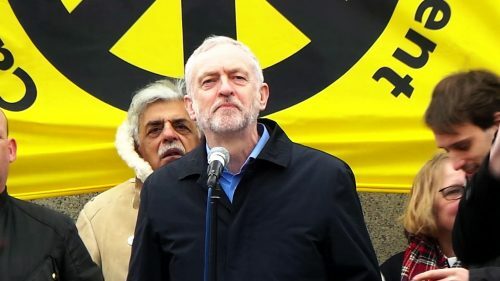 Though he has widely gained a reputation for being principled and virtuous, scrutiny of the manifesto and its consequences suggests that in 2017 Corbyn prioritised victory over virtues, and succeeded in following a pragmatic approach to winning the election whilst maintaining his radical progressive persona. Some may criticise the Labour leadership for being hypocritical, given its frequent criticism of the incumbent Conservative government’s austerity policies whilst not planning to remove them if they did win a majority. However, it cannot be denied that the only way to effect real change is to be in power, and that it is significantly harder to pass new laws through parliament when in opposition. Jeremy Corbyn is not a blind idealist. It is highly likely that he is aware of the limited potential of free higher education to achieve equality, yet it is certain that he is aware of the ability of such a policy to win votes in swing seats. After years of denouncing New Labour and their approach to winning elections, it appears that Jeremy Corbyn is surreptitiously following its example. Blairism is back, but not as we know it. Cammaerts, Bart et al (2016), ‘Journalistic Representations of Jeremy Corbyn in the British Press: From Watchdog to Attackdog’, https://www.lse.ac.uk/media@lse/research/pdf/JeremyCorbyn/Cobyn-Report-FINAL.pdf, accessed 20/03/2018. Gaunt, Catherine (2017), ‘Labour manifesto recognises importance of early years’, https://www.nurseryworld.co.uk/nursery-world/news/1161204/labour-manifesto-recognises-importance-of-early-years, accessed 20/03/2018. The Guardian (2017), ‘What would Labour’s manifesto cost? Your at-a-glance guide’, https://www.theguardian.com/politics/ng-interactive/2017/may/16/what-would-labours-manifesto-cost-pledges-money-guide-details, accessed 20/03/2018. Hood, Andrew et al (2017), ‘Income tax and benefits: the Liberal Democrats and Labour compared’, https://www.ifs.org.uk/publications/9235, accessed 20/03/2018. Labour Party (2017), ‘The Labour Party Manifesto 2017’, https://labour.org.uk/wp-content/uploads/2017/10/labour-manifesto-2017.pdf, accessed 20/03/2018. Merrick, Rob (2017), ‘Labour admits it would not end benefits freeze, after day of confusion’, https://www.independent.co.uk/news/uk/politics/general-election-20107-latest-labour-manifesto-benefits-freeze-cap-jeremy-corbyn-a7739471.html, accessed 20/03/2018. OFFA (2016), ‘2017-18 access agreements: institutional expenditure and fee levels’, https://www.offa.org.uk/wp-content/uploads/2016/09/2017-18-access-agreement-decisions.pdf, accessed 20/03/2018. Savage, Michael (2017), ‘Labour manifesto ‘would keep £7bn of planned Tory welfare cuts’’, https://www.theguardian.com/politics/2017/may/20/labour-manifesto-keep-planned-tory-benefit-cuts-resolution-foundation, accessed 20/03/2018. Skinner, Gideon and Mortimore, Roger (2017), ‘How Britain voted in the 2017 election’, https://www.ipsos.com/ipsos-mori/en-uk/how-britain-voted-2017-election, accessed 20/03/2018. UCAS (2018), ‘UK application rates by the January deadline’, https://www.ucas.com/file/147891/download?token=sjxwG1wA, accessed 20/03/2018. Watt, Nicholas and Stewart, Heather (2015), ‘George Osborne introduces new ‘living wage’ but cuts working-age benefits’, https://www.theguardian.com/uk-news/2015/jul/08/budget-2015-uk-gdp-other-rich-nations-george-osborne, accessed 20/03/2018.